Capable of withstanding a 10G vibrational force for a period of 6 hours, the components in Harwin’s new M225 connector series are intended for industrial deployment. These compact, high performance cable-to-board units feature a robust construction for prolonged operational lifespan, thanks to their glass-reinforced polyphenylene sulfide (PPS) enclosures, with a 100MΩ minimum insulation resistance ensuring continued signal integrity. 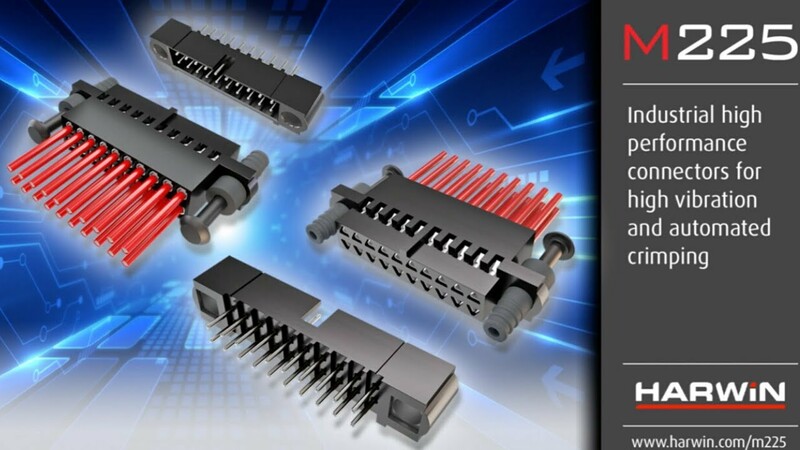 They have a double row contact arrangement with a 2mm pitch – enabling mating of their through-board PCB male connectors to the corresponding female crimp connectors – with an array of different wire sizes (from 22AWG to 28AWG) being accommodated. Each tin-plated copper alloy male contact has a current rating of 3.3A (3.0A when all contacts are electrically loaded simultaneously) and a maximum contact resistance of 25mΩ. When mated, the single-piece female contacts each have 3 surfaces touching the corresponding male pin. This means that reliable interconnection is maintained, even when placed in the most uncompromising of application settings and under extremely challenging working conditions. A rapid mate-before-lock retention system has been developed to increase mated connector holding force, and assist with vibration resilience. The female connector is fitted with rubber retainers, and locking pins are supplied loose. These pins are pushed into the rear of the mated female connector, and subsequently expand the rubber retainers to grip onto the male connector. There are shrouded contacts on both the male and female connector elements, thereby preventing damage, while polarized housings safeguard against the possibility of mis-mating. The female crimp contacts are available on reels (for high volume automated production) or loose (for prototyping purposes), with a hand crimp tool offered for low volume. An operational temperature range of -55°C to +125°C is covered and a 50 mating cycle lifespan supported. These components are aimed at factory automation and processing machinery, industrial drives, robotics, test/monitoring instrumentation, handheld test equipment and industrial automation controls. Harwin is an EN9100 accredited manufacturer of high reliability interconnects for safety critical applications. Harwin is the original manufacturer of the 2mm pitch Datamate and 1.25mm pitch Gecko connector families. The Datamate connectors offer a range of signal, mixed power and coax layouts with a variety of jackscrew fixings available and up to 3A – 8.5A per contact. The Gecko connectors are shock resistant and save space and weight on the PCB and feature latches or Screw-Lok for added security. Other popular ranges from Harwin include; The Archer connector family featuring compact and robust 1.27mm and 2.54mm pitch connectors in a wide variety of styles and pin combinations for industrial applications. And the M300 range of 3mm pitch power connectors providing up to 10A per contact. Harwin also have an extensive product catalog comprising EMC/EMI Shielding, Spring Contacts, Circular Connectors and PCB Hardware. A network of stocking distributors coupled with offices and manufacturing facilities in Europe, USA and Asia provides Harwin with a global reach and comprehensive understanding of the latest technologies. To view Harwins active portfolio of over 30,000 highly reliable interconnects and PCB hardware items, visit www.harwin.com for more information.